These Pecan Butter Tarts are a cross between a few different desserts. The first one is Pecan Butter Tarts, obviously, but only the rich, sweet filling. 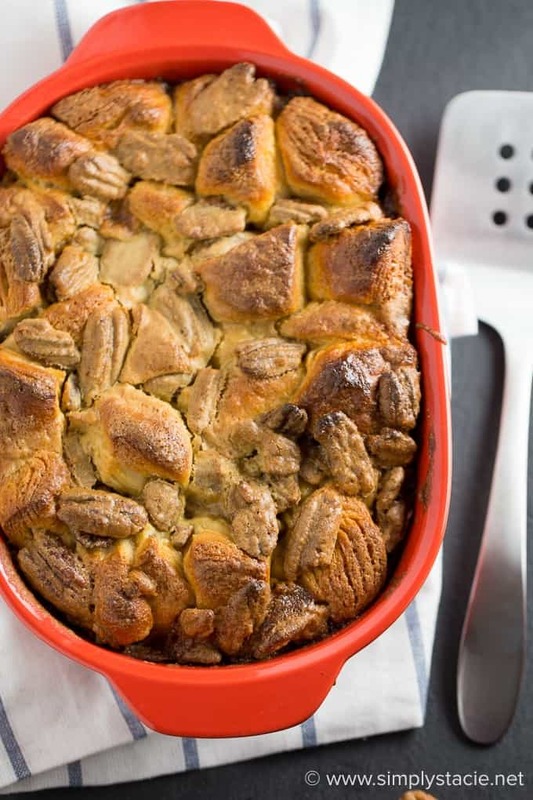 The other two are Chelsea Buns and Monkey Bread. I wasn’t sure what to call it, but ended up settling on Pecan Butter Tart Buns. So here it is. And it’s pretty darn good! Over Christmas, my sister made the most delicious batch of butter tarts ever. I’m still thinking about each gooey bite months later. They were perfect. I’ve already made Butter Tarts and shared them here before. Mental note – ask Laura for the recipe. Anyways, I wanted an easy dessert that incorporated the flavour that Canadians love so much. I used the Butter Tart filling added some pecans and a can of Pillsbury Refrigerated Flaky Rolls. Boom. 30 minutes later – dessert is served. It’s such an easy recipe that you’ll make it once and remember it for the next time. It looks even better scooped into a bowl. How’s this for decadence??? Maybe add a scoop of vanilla ice cream on top! John thought that this dessert would be over the top sweet and he wouldn’t like it. He said he was pleasantly surprised that it was not overpowering and had just the right amount. I don’t overload the amount of butter tart filling I use so that’s a big reason. I was planning to double it, but glad I kept with the amounts I did. If Pillsbury Refrigerated Flaky Rolls aren’t sold where you live, feel free to substitute another kind of refrigerated biscuit. I’m in Canada so I know they are sold here, but not sure about elsewhere. 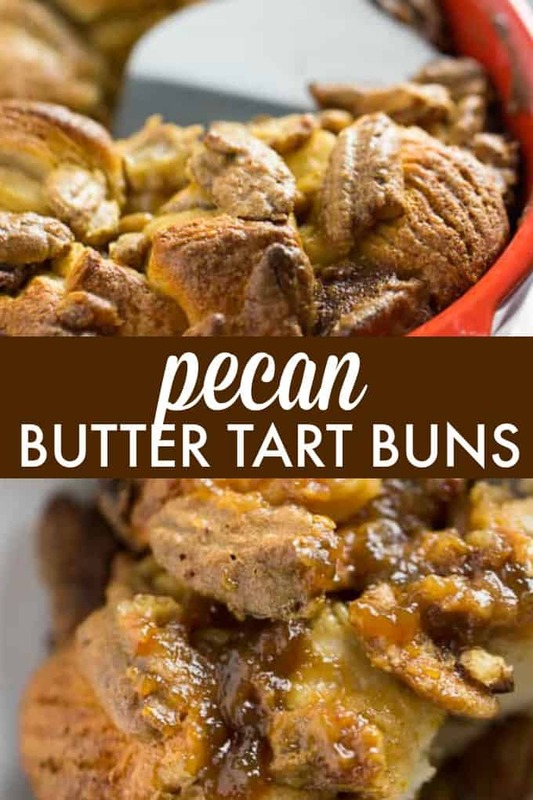 For other butter tart and butter tart inspired recipes, try these Pecan Butter Tarts and Butter Tart Muffins. Are you a fan of butter tarts? 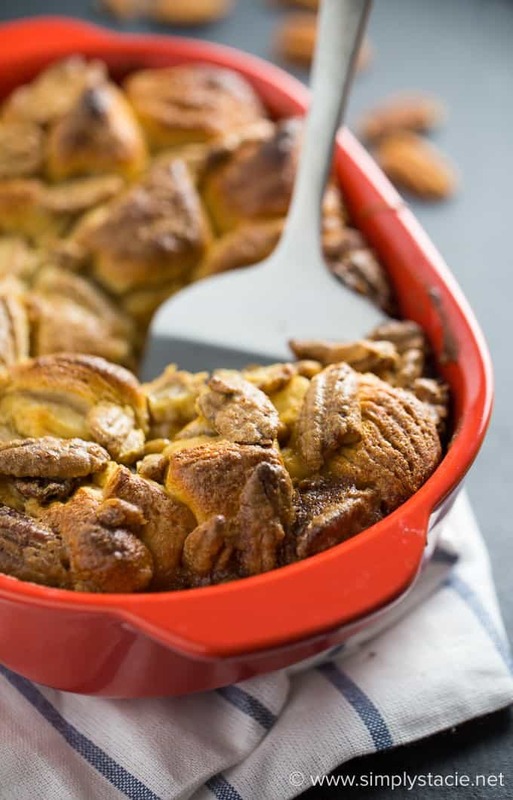 A cross between Pecan Butter Tarts, Chelsea Buns and Monkey Bread. 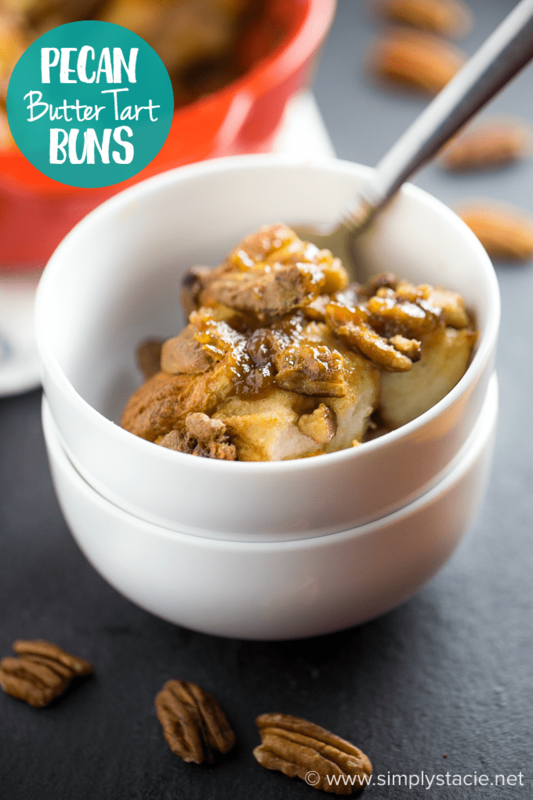 These three desserts are combined together to create an indulgent delight! Preheat oven to 375F. Grease a 1.5 quart casserole dish with cooking spray. Cut flaky rolls into quarters. Place evenly on the bottom of the casserole dish. 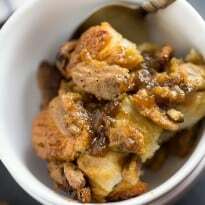 In a medium sized bowl, mix together butter, brown sugar, egg and pecan halves. Pour over the rolls. This sounds absolutely amazing and delicious! 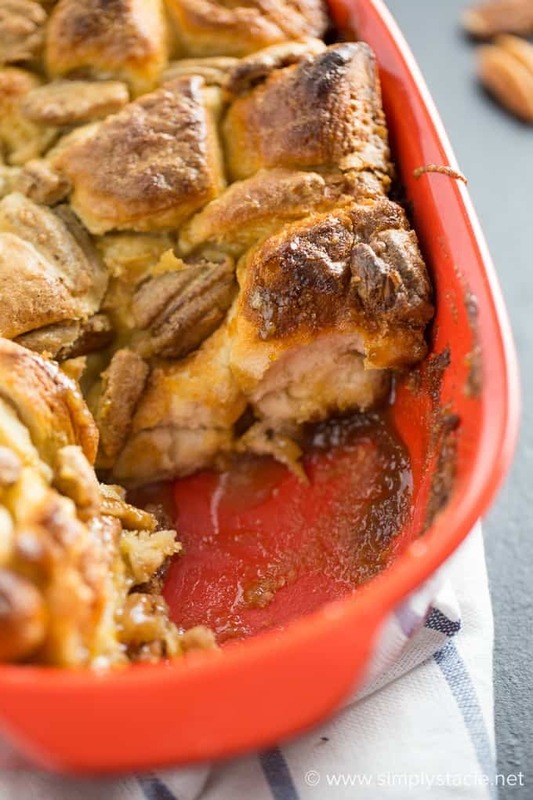 My hubby would love this for dessert, thanks for sharing I am going to make it this weekend! What a wonderfully easy recipe to make. I know this will go over good with the whole family. 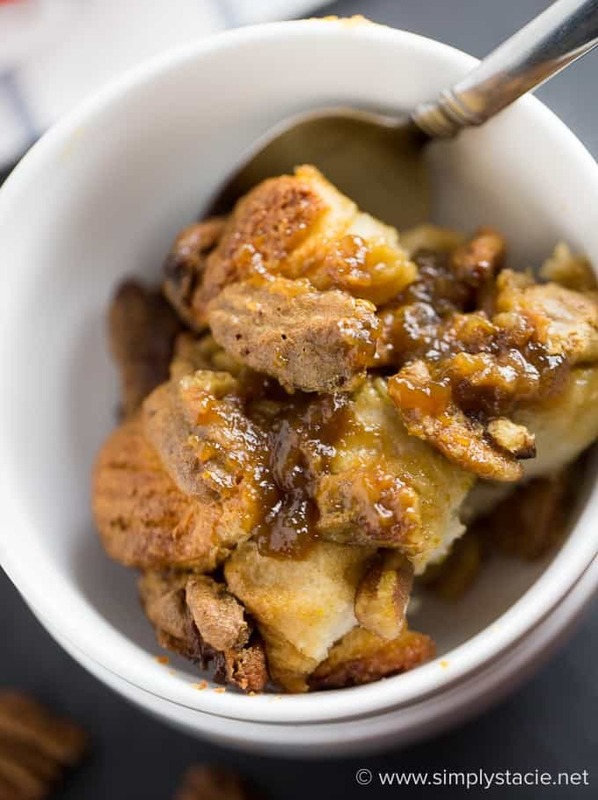 I love Butter Tarts and you sure have a really good recipe here that you have shared with your readers. I really like how easy it is to make, and it looks so delicious! These look great! We love the sweetness and softness of Pecans. Will definitely try! Oh my, I need to make me some of this, sounds so divine, I wished I had some right now, it would go great with a hot cup of coffee on this cold night!! I wouldn’t know what to call it either, but I like how easy it is to make. mmm sunday morning with coffee, yes please! This looks simply decadent!! I can’t wait to try this recipe! These sound so good and so simple! Pinned it for later! Great idea, look very delicious! Sounds and looks fabulous. Can not wait to try this. Tomorrows dessert I believe.